Grade 3 Thermal Insulation – To be awarded Grade 3, a caravan is put in to a cold chamber with all windows, doors and roof lights open. The temperature is then reduced to -15°C, the windows, doors and roof lights are then shut, the heating is turned on, and the caravan has 4 hours to reach +20°C. For those of you with older caravans, it would be worth contacting the manufacturer or researching online to find out whether your tourer has Grade 3 otherwise you might get a little chilly! If you are not familiar with touring during the winter months then I suggest you read on. I have compiled a list of tips that you may find helpful on your adventures during the winter months, some to make your experience more comfortable, while others are precautionary preparation (should the worst happen). So, if you’re sitting comfortably let’s get on with it. Always carry a supply of fresh water. If it gets particularly cold while you are on site the taps and pipes may freeze. The last thing you want is to be stranded on site without any drinking water. If you go to some of the larger supermarkets you can buy big 4-8ltr bottles which would be perfect. Make sure when you leave for your winter travels you have full gas bottles, and if you can, carry additional bottle/s. Should you get stranded somewhere, whether on site or on the side of the road, staying warm is going to be one of the most important things besides food and drink. Having a backup supply of gas will ensure that you have enough gas to heat the caravan for a while. Towing a caravan in the snow is brave, the additional weight you carry makes you more susceptible to skidding. That’s why I would recommend carrying snow chains. Particularly if you plan on travelling further afield in to Europe and beyond as it is a legal requirement in some countries and states. Be sure to plan your trip well in advance enabling you to carry out the research. If you don’t have any snow chains you can buy some here . Carry an emergency supply of food and cooking equipment. This should only be required in the worst case scenarios when you are stranded on the side of the road. Having several tins of soup and a camping stove can make all the difference, a nice warm meal will keep your energy levels up and keep you feeling nice and warm. Camping stoves are readily available and are very cheap to buy, take a look at this site that reviews camping stoves. This one goes without saying, but you would be surprised at the amount of times it gets overlooked… remember to pack warm clothes and wear extra layers. Hats, scarves, gloves, thermal socks – you know the drill! You can also buy thicker sleeping bags for the winter months. Again, these warm clothes are essential if you were to get stranded. Things can get pretty slippery, so always carry a broom that you can sweep the fresh snow from your step with. This should help stop the build up of ice. A broom is also handy to sweep thick snow from your windows etc. It is always wise to carry some rock salt, a shovel and grip pads (or a piece of mat / carpet). So in the event you get snowed in on site, you can shovel away the excess snow, throw some rock salt down to melt he rest and use the grip pads to place in front of your wheels to get you moving. Consider leaving your heating system running while you are out during the day, if you have a thermostatically powered heating system this can in fact save on fuel. If you have a programmable system, you should set your heating to switch on an hour or so before you intend to arrive home, this will take the cold edge off the air so you can return home to a nice toasty caravan! Because of all the extra equipment you may be carrying you will want to be extra careful that you are not exceeding your recommended towing and load weights. Not only is it against the law to exceed these limits, but it can be extremely dangerous to do so. As I mentioned above, a heavier set up is a lot harder to slow and stop in the snow and ice. I recommend either weighing everything as you pack it, or taking your fully loaded caravan to a weigh bridge to be 100% sure. And that’s it! 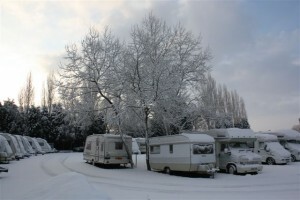 My list of winter touring tips for caravanners. I hope you have found them helpful, and please, if you have any other tips of your own use the comments section below to add them. Have a safe and wonderful winter touring season and a Merry Christmas to you all. No problem Alan, thanks for stopping by! Great tips! Your blog will help me a lot. You’ve taught me a lot with your guide. Thanks for the useful links. I am planning our considering living full time in my caravan. Amy tips?